It has been suggested that to be interesting you have to be interested. I don't do it with the aim of looking interesting from the outside, but I do value the emphasis on being interested- and the encouragement to follow up on whatever interests you. I think of them as 'whisker twitchers' you might not know why they catch your attention but something about it reaches out and hails you, makes your whiskers twitch, and so I try and notice them, and follow up. Having been a lifelong bookworm and have been accused of inhaling books. Having had little money for a long time I spent many years not allowing myself into bookshops and viewing them as an expense I couldn't afford. Libraries are great and I still use my local voraciously. But it doesn't have everything I want to read, so now I allow myself to buy things that interest me and actively look for and note references to other books that also sound interesting. My wishlist is getting longer & longer! 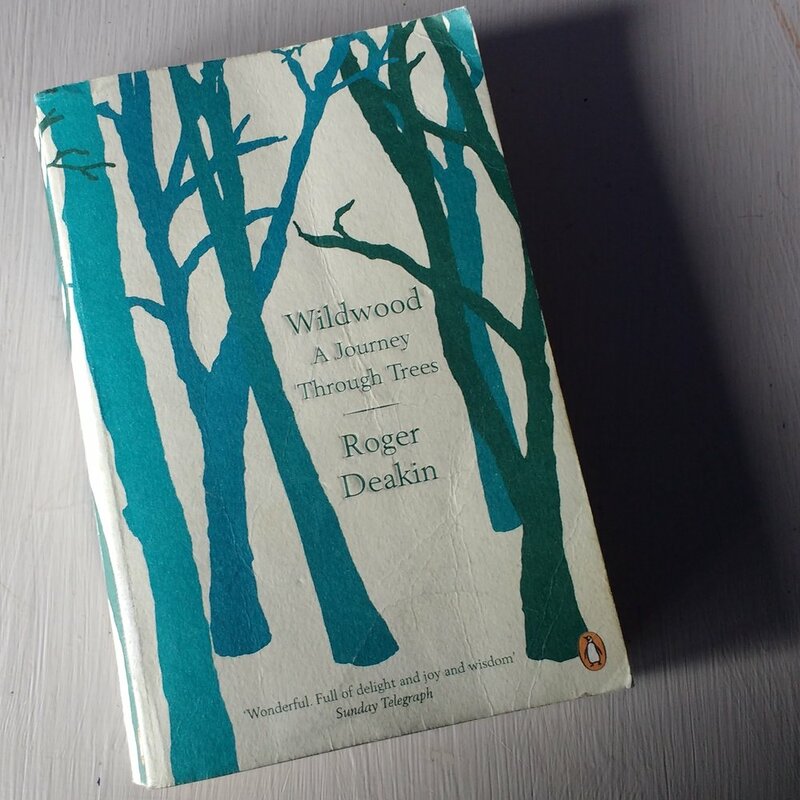 One book I read recently is Wildwood by Richard Deakin. True to form I zipped through it fairly quickly while my ankle was recovering. One line struck me particularly forcefully - although when I went back to look for it with a pen and paper I couldn't find it. Have you read anything inspiring recently that made you think differently? When I signed up for this year's international ceramics festival I didn't even check who would be appearing. I was so disappointed in myself for missing it last time round that I just booked straight in as soon as bookings opened! When the programme came through and I finally saw who would be at the festival imagine how lucky I felt to discover that Curtis would be there! I managed to see both of his live demonstrations, his slide talk and the temporary studio space where he was working as well as a selection of the newer finished pieces in the gallery. What a great immersion. It was fascinating to see some of his working processes, the materials and tools, to hear him talk about his experience at the Blast and see more pictures of the site, and to be able to examine the finished pieces up close. He also talked about vessels vs sculpture and his experience of visiting ice caves and realising the mountains were also vessels with insdes very different to their outsides - plus the way in which a lid on a pot always encourages a visitor to stop and interact! The thing that really made my weekend was being able to ask him about his creative process and how he developed from the initial inspiratory experience towards a finished piece (this is where I'd been having some trouble... I'm grateful that he felt able to be honest enough to say that initially he had no idea where he wanted to go with this new work, but he looked hard, thought about what interested him in the experience and how he could in some way evoke those processes in the studio - and then he messed about! Through that play some things had interesting results and others less so. By paying attention to the interesting results one piece of work would inspire the next and that process led to the work developing. When you look at the finished pieces it makes sense that he was fascinated by the unearthly colours and textures, layerings and contrasts at the Blast, but the pots are not in any way direct representations of it. I had begun to reach a similar conclusion myself about how to develop the creative process that might lead towards some new work of my own, but it was confidence boosting to hear it from the mouth of a master. Thank you for sharing Eddie! PS. I wrote a long survey post about the festival but then the computer deleted it & I didn't have the heart to re-do it all. You can see most of the images in my Instagram feed. Sorry you miss out here, but feel free to email if you have burning questions and I'll be happy to respond! As spring progresses we have become more aware of the state of our new back garden and how much better it could be. A chance sighting of Brazilian designer Burle Marx's work on tv has been inspiring. Initially an artist he brought an artistic vision to his work as well as a committment to the place he was working, using native flora and style rather than harking back to a European tradition. What I particularly relished was his use of structure - in a way that was not formal ( a big eye-opener that has set my mind whirring! ), rhythm, repetition and block planting to draw attention to the characteristics of one plant. I also enjoyed his focus on the character of a plant as a whole rather then being tightly focussed on flowers as so often happens in English gardens to rather ditzy effect. I am blessed here with a manageble number of good galleries and am making a renewed effort to get to each at least once a quarter to see whatever they are showing as a way of expanding my horizons. This weekend it was the turn of the Towner in Eastbourne. I knew that I had read the programme and thought it might be interesting but by the time a free afternoon became available I had no reccollection of what was on so it was a total suprise! The one that resonated most for me was 'A certain kind of light'. The piece that has stayed with me most strongly is the Colour construction, 1960, by Peter Lanyon (the blue glass form in the first gallery installation view). I loved the layering and the shapes and the way he had used the qualities of the glass to do something new. Raphael Hefti's work also had an intrguing process, using the chemicals within the plant to 'burn' an image directly onto the photographic paper, with intriguing results. It was interesting to see the two larger installation pieces by Katie Peterson and Mark Garry, one so fun and un-gallery-like it made me laugh and then almost fall over with the way it disrupted my sense of balance (according to the lable it had something pretty clever to say about the cosmos but I didn't get my head around that side of it), whilst the latter was quiet, subtle and almost invisible from some angles but very pleasing for the way the tiny threads bounced and twisted around the space to make something more than the sum of its parts. David Batchelor's piece had a Mexican approach to colour that also speaks of fun, and was certainly cheering in it's effect, but his use of waste plastic bottles in many colours and forms gave it significance. Light is super-important to me, so such so that I hardly even think about it, so it was useful to see so many different approaches to it and think again about what it is, how it behaves, the impact it has on materials and on the viewer. The show is on until May 7th 2017 if you want to catch it yourself. This weekend I saw the film Sonita. It's a documentary about Sonita Alizadeh, a young Afghan rapper and her attempts to avoid forced marriage and become a working musician. Her courage is truly inspiring in the face of struggles that make me very grateful to have been born in the UK. The director is Rokhsareh Ghaem Maghami. In the making of this film she flouted Iranian law, stepped out of documentary conventions, and in doing so she showed that despite her limited freedoms she could use her knowledge and connections to a wider world to transform at least one person's whole life story. I don't know if or how I could do that for another person, but I salute her example. You can see the trailer here. This year I am launching a new strand of blog posts, entitled 'Exploring'. They will be a very mixed bag, noting new discoveries in any and all fields of interest. I love finding interesting new things/places/ideas/people etc and look forward to sharing them with you. I kick off with Michael Craig Martin's memoir/life lessons which was reccomended to me last autumn. I found it a really interesting read, both as an overview of an artist I was not that familiar with and particularly for his insights into the practice of making art and maintaining a career as a working artist. Two points stuck out strongly for me. Chapter 4 "On being vulnerable to the world" called attention to a phenomena that I was vaguely aware of: that I seemed to notice & be impacted upon by the world around more than other people seem to be. This has been both positive and negative for me so his notion of vulnerability resonated. "There is nothing that happens in an artist's life - whether good or bad, no matter how dramatically important or apparently trivial - that cannot be turned to effective use in their art. Any crummy part time job, any minor incident, any childhood memory. Other people can read a book for pleasure or enlightenment. An artist may read a book and it can alter the whole course of their life's work. Artists are unusually vulnerable to the worl this way. And they, in turn, use their work to seduce others into valuing what they value." Chapter 59 lays out what he sees as the three stages of 20th century art, a series of phases radicalising the possible style, medium and then content of an art work. His career spanned the latter two and he argues persuasively of the need to be engaged with the 'burning question' of the day.